Bleeding after you brush your teeth is the first sign of a periodontal condition. Even if you are brushing your teeth too hard, your gums should not bleed. Brushing your teeth too hard is not a good dental habit, especially if you have irritated or inflamed gums, but there is generally an underlying periodontal problem causing your gums to bleed. If you have chronic bad breath (halitosis), it may be a symptom of periodontal disease. The bacteria that is getting trapped in your gums can cause your breath to smell bad no matter how much you brush. Swelling and a change in the color of your gums are signs that something is not right. Dark red or purple gums, especially if they also bleed, are a serious sign of periodontal disease. Sometimes, gums can change color due to certain lifestyle habits (such as smoking or a poor diet), which increase your risk for periodontal disease. Periodontal disease causes your gums to recede and show more and more of your tooth than normal. When the gums pull away, it can cause a lot of damage and discomfort when the tooth root is out in the open. If you look in the mirror and see too much enamel and not enough gums, this could be a sign you have periodontal disease. In the more advanced stages of periodontal disease when the roots of your teeth are exposed, you may feel a sharp pain when you eat or drink something hot or cold. This could also be a symptom of having a cavity and should be checked out by your dentist. If the sensitivity is located near the gumline, it is more likely to be caused by periodontal disease. Hopefully, you will go see a dentist at the earliest signs of gum disease. However, if you put off treatment, gingivitis can progress to periodontitis and you'll have more advanced symptoms. Some of these include loose teeth and exposed tooth roots. Weak gums can progressively compromise your teeth. If the gum is too weak to hold the tooth, then a loose or missing tooth could result. Ongoing infection is also a risk to consider. Collected bacteria in your mouth can cause an infection in one of the pockets of your gums. A pus-filled periodontal abscess will inflame your gums and cause significant discomfort, especially if left untreated. The infection can also enter your bloodstream, which will impact the health of your whole body. 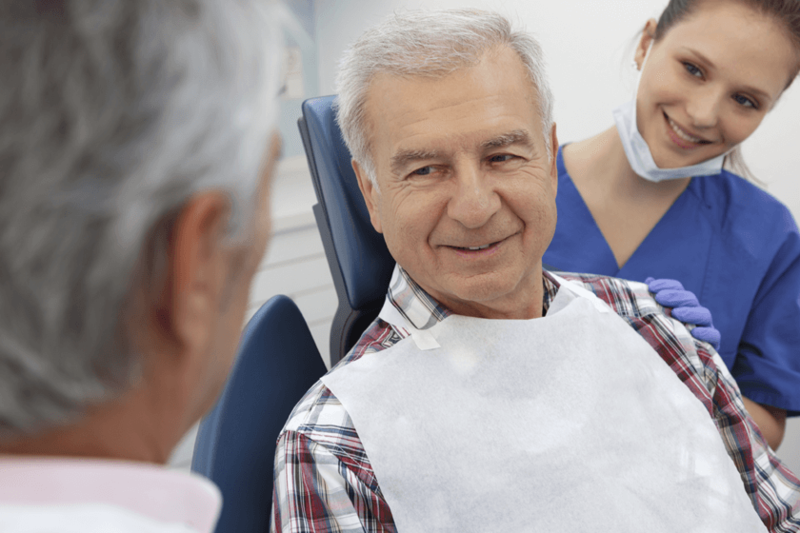 Scaling and root planing (sometimes called a deep cleaning) is a treatment that your dentist can perform to clean out the plaque, tartar, and bacteria buildup in your gum pockets. First, the dentist will use a scaling instrument to remove the debris from your gum pockets. Then, they will plane (or smooth) the enamel so there are fewer areas where debris and bacteria can get trapped and turn into buildup. One or several scaling and root planing treatments can usually reverse the damage caused by gingivitis. A round of antibiotics may be necessary to heal infected gum tissue. Antibiotics are typically prescribed after a scaling and root planing treatment to eliminate any lingering bacteria and help the gums heal. Periodontal surgery will correct the deep pockets that cause all the problems (collecting bacteria, getting infected, and destroying your gumline). Depending on your situation and the preference of your dentist, there are many ways to perform periodontal disease surgery. Your dentist will walk you through the process and help you make an informed decision about what route to take. If you have signs of gum disease or you are at high risk for developing it, schedule an appointment with your dentist. DentalWorks - High Point can identify gingivitis and periodontitis then offer a custom treatment plan. We can usually reverse gingivitis with one or more scaling and root planing (SRP) treatments and antibiotics. If your gum disease has progressed to periodontitis, our practice in High Point, NC can perform laser gum surgery to repair your mouth.